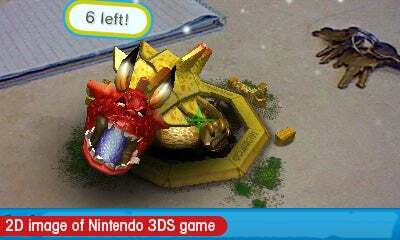 Let's get a few things out of the way: Yes, the Nintendo 3DS's splashy glasses free 3D is impressive. No, it won't make you crosseyed or blind. Yes, the 3D effect you've heard so much about creates clever and often fascinating gameplay. No, the preloaded games and apps and snazzy new features aren't slam dunks. Yes, Nintendo once again built a piece of gaming gear that takes big risks, though while some pay off, others remain unproven. And yes, for the £190 Nintendo's asking, you'll probably want to buy one if you're a steadfast Nintendo fan. But only probably. If Avatar 3D wasn't your thing, if you couldn't care less about stereoscopic 3D, if you'd rather not fiddle with fussy menus or social networking apps or 3D pictures you can snap and share with friends, the 3DS probably isn't for you. Let's get this straight, too. 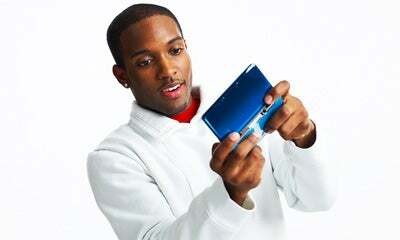 The 3DS may be less a gaming handheld than a totable multimedia centre, only one of whose activities happens to be gaming. 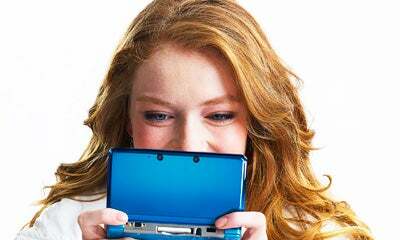 Nintendo opted to load the 3DS with all you need to get started, plus a few unexpected extras. From a box twice the size of the DSi's, you'll pull an AC adapter, the manual and setup instructions, a drop in place charge cradle, a pack of "augmented reality" cards (more on these later) and the 3DS itself, which includes both a telescoping stylus and pre-installed 2GB SD storage card. Your first look at the system may feel anticlimactic. The design team traded the flush edging of prior models for an oddly edge-beveled, slightly oversized top lid built to accommodate the dual away-facing cameras (used to capture 3D images) as well as the larger, more advanced auto-stereoscopic screen. But place the 3DS next to the DSi and you'll discover it's actually significantly smaller. Where the DSi weighs 11 ounces, the 3DS clocks in at a trifling 8.1 ounces, just 0.4 ounces heavier than the family's slimmest member, the DS Lite (though still nearly 3.5 ounces heavier than Apple's glass and metal iPhone 4). Holding it for hours at a time feels effortless, and my only complaint reviewing the "Cosmo Black" model is about the glossy finish's tendency to smear (the alternative "Aqua Blue" version seems a less messy bet). On the left spine you'll find the SD card slot (for games and data storage) and a sliding volume control, a welcome improvement from the DSi's irritating rocker switch. 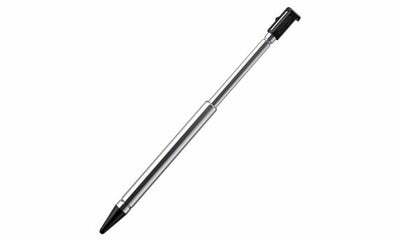 On the right spine rests a sliding switch for turning wireless access on and off. It shifts back automatically, making it unlikely you'll accidentally bump it and shut down your connection. The top spine includes the standard left and right bumper control buttons, an infrared port, a power adapter connection and the open-air game cartridge slot. I suppose the lack of defective DS systems over the years vindicates Nintendo's preference to leave these slots unprotected. 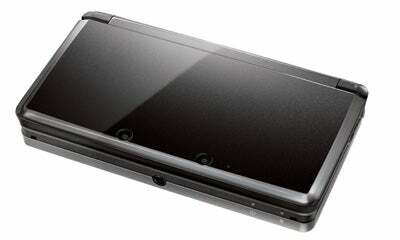 Flip the 3DS open and you might mistake it for a DSi. Both units have relatively spacious dual screens, stereo speakers, a d-pad and four diamond pattern buttons, power, start and select buttons, and a single facing-toward-you camera. The 3DS adds a thumb-joystick for analogue 3D game control, positioned just above the digital d-pad and flush with the system frame. It's similar to Sony's PSP thumbstick, but larger and more comfortable over extended play periods. Nintendo also shifted the START and SELECT buttons to just below the bottom screen, and dropped in a 3D slider, top right, that lets you change the visual depth of 3D images or disable the effect entirely. Of course the 3DS's top screen, where it works its 3D magic by feeding separate images to each of your eyes, couldn't be less like the DSi's in terms of capability. Where the DSi employed a 3.25-inch TFT LCD, the 3DS lops a bit off the top and extends the edges, giving its slightly larger 3.53-inch auto-stereoscopic LCD more of a widescreen feel (it's technically 5:3 aspect ratio, or 15:9, instead of the more conventional 16:9). It's also capable of producing much sharper images with 800 x 240 pixels, or 400 x 240 pixels sent to each eye in 3D mode. Prior DS screens only supported 256 x 192 pixels. Getting the 3D effect to work properly, and continue working, takes some getting used to, and requires you and the 3DS remain relatively still. For instance, you're asked to position your face away from the top screen slightly more than a foot, or about normal viewing distance, then remain perfectly centred at all times. But shifting as little as 10 degrees in any direction spoils the 3D effect and causes images on the screen to double or blur. It's not a problem for games that don't use the system's motion sensing features, but it's a deal breaker for others that require you to tilt and jostle the entire unit. If you don't keep your line of vision fixed perpendicular to the screen, you slip out of the "sweet spot" and the image gets garbled. The system comes flush with preinstalled apps, including a clever sounding albeit slightly daft little game called Face Raiders. The game starts by snapping a picture of your face, mapping it onto flying objects, then pits you against dozens of clones (what would your therapist say?). More impressive, though occasionally impaired by the same field of view issues, the 3DS can read "augmented reality" cards that use the 3DS's camera to transform ordinary objects around you (in the real world) into virtual thingamabobs you can fiddle with, or defend yourself from (yep, some even attack you). Imagine pointing your camera at a chair, then watching a garden suddenly bloom from the seat surface. Or a bunch of archery targets that you can only hit by getting up and moving the 3DS around (in real space) to find the perfect angle. Kind of eerie the first time you try it, but also pretty darned cool. Want to make a Mii? You can (actually, you have to) but using the 3DS's VGA cameras to snap your face and come up with an approximation tends to produce avatars that look like strangers. I guess that's what you get from a 0.3-megapixel camera, the same subpar resolution as the DSi's shooter. The new Home menu button serves as the handheld's "get out of anything" option, suspending apps or games and giving you quick access to other system functions. The home page it conjures includes an option to squeeze your apps onto one page (no more scrolling left and right), and the 3DS's higher fidelity screens keep everything looking sharp and tidy. From here you can launch Game Notes (to scribble bits of info), the Friend List (see what your friends are up to), Download Play (download 3DS or DS games), a 3DS Sound app (record sounds and lightly fiddle with them) or an Internet browser (though the browser isn't yet working, Nintendo says it will be shortly via a system update). The system still exhibits signs of a work in progress. Some of its features like the Friend List and 3DS Sound app feel underdeveloped and over-simplistic, while others like Face Raiders and the "augmented reality" card games too often spotlight the field of view issue in 3D mode. We weren't able to test features like StreetPass (wirelessly exchange data with other nearby 3DS users) and SpotPass (hop onto wireless hotspots to download software and videos), both of which sound promising, but there's definitely a sense Nintendo's still figuring things out. That said, there's never been a handheld quite like the 3DS, one as brimming with features as well as potential, and offering an experience that's frankly impossible on other mobile devices like Apple's iPhone 4 or Sony's upcoming PSP successor. If you want the next big idea from Nintendo, this is it.